We offer 868 Double Wire Mesh Panel Fence,Double Wire Fence,Double Horizontal Wire Mesh Fence. 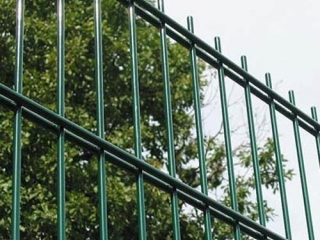 Double Wire Fence Panel: Using high quality Iron Rod as raw material, the welded panel, after galvanization, Powders Primer, and Powders top coating; it can resist the corrosive and ultraviolet radiation very strongly. The thickness of powder coating is 100-120 microns usually. The choose wire diameters are 6MM*2+5MM*1.8MM*2+6MM*1. It obtains high strong powers to resist the construction. Double Wire Fence, with its flat panel, using double horizontal wires and a vertical wire to form a rigid mesh. The surface treatment is coated by hot dipped galvanization or electric galvanization + polyester powder. Double Wire Fence's fitting is a square post or a peach post. Double Wire Fence are popular in German market, using for parks, industrial sites, residents etc. Double Wire Fence size: 200 mm x 50 mm x 2.5 Meters x from 630mm - 2630mm or available on request. Post: This system usually choose Square Post (50*50mm, 60*60mm), Rectangular Post (80*60*2.5mm, 120*60*3mm) with the high strength and so on. With plastic caps or Roofing rainhat. The finished surface usually is Galvanized and Powder coating, or alternatively. Fastenings: The panels and posts are jointed together with bolts or rivets, using the steel flat bar, or special steel clamps, all nuts are self-locking.This also can be designed as the special clients requests. other standard colors available on request.